Sammy Hagar has told WKYC that he wants his former band MONTROSE to be inducted into the Rock And Roll Hall Of Fame. "I'm on a campaign now to get that band on the ballot somehow," he said. "Because without MONTROSE, there would be no VAN HALEN, there wouldn't have been MÖTLEY CRÜE, there wouldn't have been DEF LEPPARD. Every band I meet, they're like 'The first MONTROSE record! The MONTROSE record!' I think we should be in the Hall Of Fame." Regarding his own induction, Hagar remembers the night fondly but wishes the rest of his VAN HALEN bandmates had attended the event alongside him and bassist Michael Anthony. "It was cool," he said. "It just would have been great if the rest of the VAN HALEN gang had come. Dave [Lee Roth] and I would have both participated and done a song each and all that. But you know, those guys are hard to get along with. [Laughs] I'm sorry, folks. I think everybody is starting to realize it now." Hagar went on to say that being in the Rock Hall "means everything. It's a validation that I haven't wasted this life and didn't make it," he said. "It's a validation. Yeah, 'You made it.' And you can show that to your grandkids. There's so many bands that get up for nomination year after year and don't get it. Everybody I know that isn't in the Rock And Roll Hall Of Fame but should be, is bitter. So I'm not bitter." 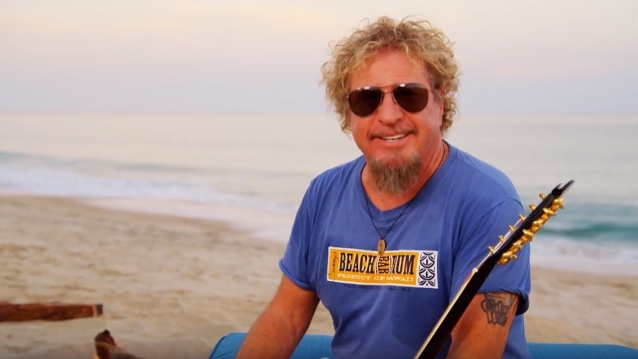 In addition to his stints in MONTROSE and VAN HALEN, Hagar is also known as the vocalist for supergroup CHICKENFOOT, which includes Anthony, guitarist Joe Satriani and drummer Chad Smith. The Red Rocker notched a Grammy Award in 1991 for "For Unlawful Carnal Knowledge", and is also a member of THE CIRCLE, which features Anthony, drummer Jason Bonham (son of John) and guitarist Vic Johnson.